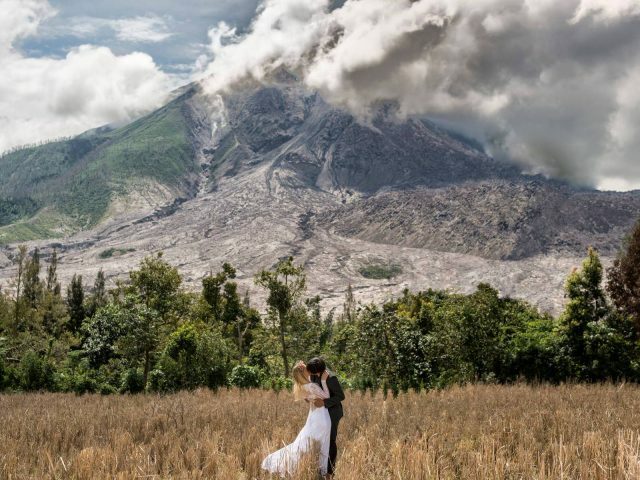 Is It Possible to Have a Prenup Photo with an Erupting Volcano in the Background? Sutopo Purwo Nugroho, the head of public relations at Indonesia’s Disaster Management National Agency (BNPB), has given a hint that it can be done, as long as safety precautions will be observed. On October 25, Sutopo shared on his Twitter page a prenup photo taken in front of Mt. Sinabung. Located in Norther Sumatra, Mt. Sinabung has been actively emitting hot ash since 2010. “A pre-wedding photo with the background of an erupting Mount Sinabung. Volcanic eruption tourism, from a safe distance, has a potential that must be developed,” says the translation provided in a report by Coconuts Jakarta. The said pre-wedding photo is owned by Malaysian photographer Keow Wee Loong, who has been known for his daring photography projects. The image shows him embracing his wife Marta Keow while the volcano in the background continues to emit hot ash. The couple traveled to 10 more countries, including Norway, Japan, Italy, England, Austria, Germany, Poland, Malaysia, Sweden, and Denmark, to have their photos taken in different scenic locations. What do you think of Sutopo’s idea? If given a chance, will you be brave enough to have your very own prenup pictorial in front of an erupting volcano? Look at These Santorini-Inspired Prenup Photos!